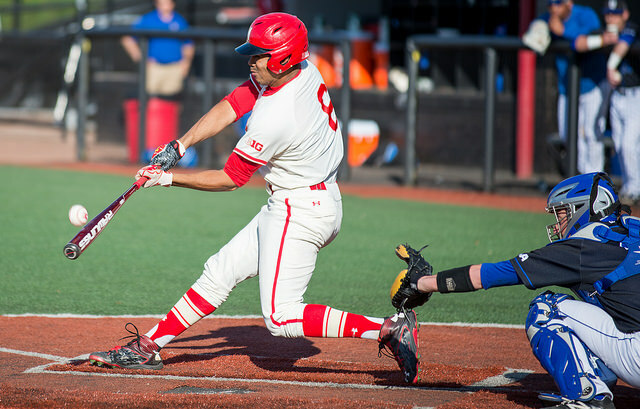 Last season, the Terrapins knocked off the University of South Carolina—the top team in their Regional, to punch their ticket to the Super Regional. The Terps had a chance to do the same tonight, a year later, but fell 4-2 to UCLA Sunday, setting the stage for a winner-take-all Regional Final game. Redshirt-freshman Ryan Selmer, making his third start of the season, took the loss, and sophomore reliever Tucker Forbes got the win. Senior closer David Berg recorded his 13th save of the season. The Bruins struck first when sophomore Luke Persico singled with runners on the corners to bring in the game’s first run. UCLA replicated the run-scoring formula in the 2nd inning, getting a leadoff single from sophomore Darrell Miller Jr, with junior Christoph Bono following with a sacrifice bunt. With two outs, junior Kevin Kramer singled to increase UCLA’s lead to 2-0. Junior LaMonte Wade’s bat cut the deficit in half when he led off the 3rd inning with a solo home run over the right-field fence, but it was all the Terps could muster in the half-inning. Junior center fielder LaMonte Wade hit his second home run of the Regional Sunday night. UCLA battled back in the bottom half of the frame, once again starting the inning with a leadoff single. Two straight two-out singles brought left-fielder junior Ty Moore in to score, giving the Bruins a 3-1 lead. Selmer exited the game after just 2.2 innings, giving up eight hits and all three of the Bruin runs. Junior southpaw Zach Morris took over for Selmer, inheriting a base runner and a 2-0 count to Bono. Morris eventually walked Bono (charged to Selmer), but got the next batter to ground out to end the inning. The Terps managed to push one more across in the 5th inning, when freshman Kevin Smith executed a safety squeeze to bring in senior Tim Lewis. But, that’s as far as the Maryland offense would get as the Bruins shut-down bullpen took over. After Forbes followed up the end of the 6th with a perfect 7th inning, the Bruins added some insurance when Ty Moore scored his second run of the game. Moore stole 3rd with two away in the bottom of the inning and scored when junior catcher Kevin Martir’s throw got by junior third baseman Jose Cuas. Berg, the Bruins career saves leader, came on in the 8th inning and worked a six-out save. The right-hander danced out of danger in his first inning of work, getting Cuas to fly out and sophomore Nick Cieri to ground out to strand runners on first and second. The closer set the Terps down in order in the final frame to stave off elimination. The Terps and the Bruins will meet again tomorrow night at 11:00 p.m. ET to compete for a spot in the Super Regional.